Jump to loaded U-cup size charts. The loaded U-cup is an excellent seal in low pressure rod and piston applications. As the system pressure increases, the loading lip force also increases, automatically compensating for the higher pressure while maintaining a positive seal. A variety of styles, materials and sizes are available to suite your specific requirements. The Standard O-Ring Loaded U-Cup profile is square in cross section and it is suitable for both rod and piston applications. The Standard design can be widely used to replace existing hydraulic packing and O-Rings without changing gland design. The deep O-ring loaded U-cup design is a modified version of the standard square shape. 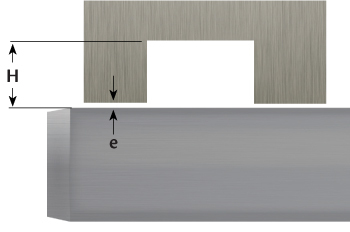 This design has approximately 1-1/2 times the axial depth of the square profile, which greatly adds to the stability of the design in higher pressure applications. Generally, you would have to make gland modifications for this seal when replacing O-Rings, but this design is ideal for replacing V or W packing or braided rope packing. 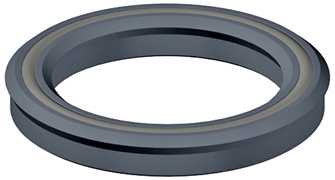 The Type B O-Ring Loaded U-Cup is similar in design to the Deep but it features a back beveled sealing lip designed for additional film breaking ability and increased squeeze on the sealing surface. By adding the back bevel on the lips, it aligns the seal interface near the centerline of the O-Ring energizer to provide increased sealing force which adds to the low pressure sealing capability while also increasing the high pressure sealing ability. The added length also provides stability to the seal. lip design, while still being able to replace o-rings without changing the groove. Go to loaded U-cup size charts. 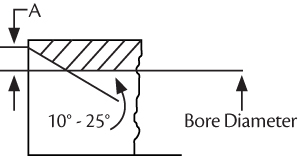 The chart below provides you with a general guideline on surface finish. However, RMS surface finish alone does not ensure good seal performance and in some applications you will need to contact Hi-Tech Seals for additional recommendations. Surface finishes that are too high or too low can reduce seal life. 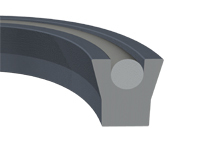 Chamfers are used as a guide to aid seal installation. The “A” dimension shown below will allow the O-Ring. Loaded U-Cup to enter a cylinder bore and should be the minimum width designed. Several variables affect a u-cups ability to resist pressure. These factors include material, heat, and extrusions gap.